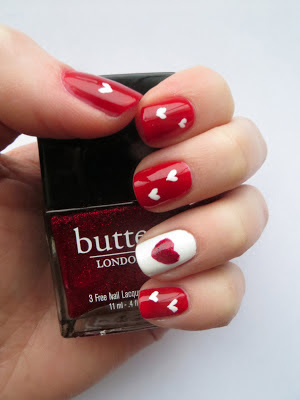 I managed another midweek mani this week, all in honour of it being Valentine's Day today. One of my classes has become particularly keen on seeing my nail designs and trying to divert me by asking for step by step instructions on how to recreate them! Yesterday I mentioned that I was going to try a V Day design so they provided me with a hand and nail outline, with a company logo, for me to try out my ideas on - bless. For the base I used Sinful Colors in Ruby Ruby (I think I picked this up in the US somewhere, probably CVS or Walgreens, for my Amy Winehouse Halloween costume in 2010) - it went on really smoothly and gave a lovely glossy finish, Barry M White for my accent nail base, Butter London Chancer for the sparkly red heart and Models Own white nail art pen/striper brush for the little white hearts. What do you think? 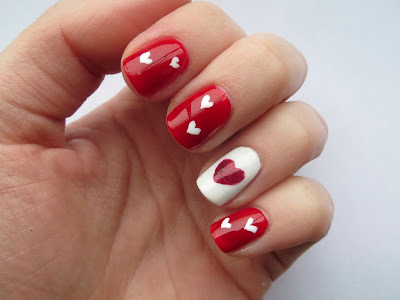 Have you tried out a Valentine's mani this year? What plans have you got for the big day?